The New Orleans style band Göta River Jazzmen was founded in the 1950’s. After a long break the band was re-established in 1988 with two of the founders: Lars Ehnström, trombone and Esbjörn Olsson trumpet, who were active until 2010. The band was well-established with annual tours in Europe. Göta River appeared on both radio and TV, and attracted a large audience far beyond the ordinary jazz circles, not least because of its well-attended church concerts. After 2004 the line-up has changed over time, members of the crew have signed off, but the Gota River ship has not been abandoned – it has gained very competent replacement! New Orleans Jazz was a ”utility music” used to joy and sorrow. This has been and remains the guiding principle for the orchestra. 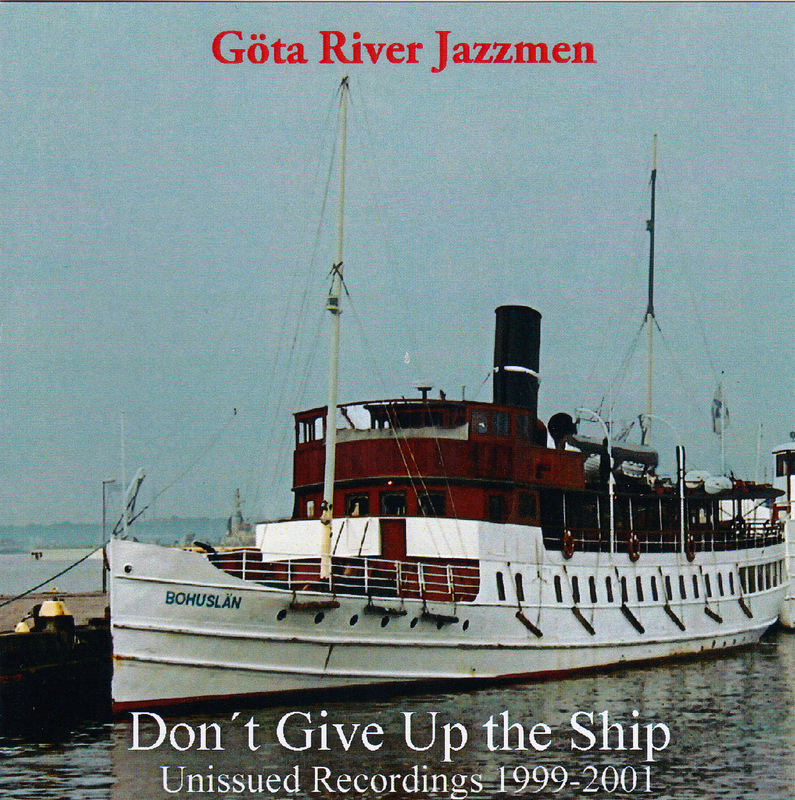 Between 1997 and 2006 Göta River Jazzmen produced ten CDs, very well received by reviewers worldwide. This CD presents thirteen songs recorded in 1999-2001 which were not included in the released discs, either for reasons of space or because of a missed note or other minor blemishes. We hope that the listeners overlook these flaws and still enjoy the New Orleans-inspired sound. DON´T GIVE UP THE SHIP – Harry Warren & Al Dubin, from the First National Pictures “Shipmates Forever” (1935). DO YOU KNOW MY JESUS – William F. Lakey & V.B. Ellis, 1957. They were associated in the Tennessee Music Company. 1919 MARCH – Also known as ”1919 RAG”. This is not the Karl Koenig march “Rifle Rangers”, as previously suggested. According to other information it is a French march by Michel Jouve & Frank Terran. GOING HOME (Ken Colyer). Blues, first recorded by Colyer’s Jazzmen with Chris Barber and Monty Sunshine. DOWN IN JUNGLE TOWN – Theodore Morse & Edward Madden, 1908. Subtitle “A Monkey Ditty”. Monkey songs is a strange phenomenon from Tin Pan Alley after 1907! LOVE SONGS OF THE NILE – Nacio Herb Brown & Arthur Freed 1929, used in the 1933 film “The Barbarian” with Ramon Novarro. YOU BROKE YOUR PROMISE – Kay Starr, Irving Taylor & George Wyle, 1949. ST LOUIS STREET BLUES – Walter Melrose & Marty Bloom, 1927. There is a classic recording by Louis Armstrong´s Hot Seven with the original title MELANCHOLY BLUES. George Lewis recorded it in April 1954 under the title ST LOUIS STREET BLUES (recorded in the Southland Studio, St Louis Street, New Orleans). MOONLIGHT AND ROSES – Ben Black & Charles N. Daniels (as Neil Moret) wrote the lyrics in 1925 and added them (without permission) to the melody Andantino in D-flat by Edwin Lemare. WHEN MY DREAMBOAT COMES HOME – Dave Franklin & Cliff Friend, 1925. The tune was used in several Warner Brothers cartoons from the 50´s. WHEN I LEAVE THIS WORLD BEHIND – One of the thousands of songs by Irving Berlin. ÖVER MÖRKA DJUP – Gustaf Wallteng was the director of Salvation Army music department 1931-1935. This song, his most famous one, was published in Favorite Songs 1921. Ingemar Wågerman p, Bertil Boström b, Hans Åsberg dr.